Join At Home In Louisville Real Estate Group this Sunday October 29th from 2-4 at 2 open houses! Take a tour of our new listing on Lotis Way in Brownsboro Village or join us in Shepherdsville in the Meadow Peak subdivision at our beautiful listing on Loretta Drive. The open house on Loretta Drive will be a group open house with opportunity to view four homes in Meadow Peak. 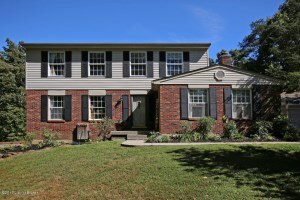 Enjoy a sunny Sunday in October and view some lovely homes for sale in the Louisville area! Happy Halloween from At Home In Louisville Real Estate Group! 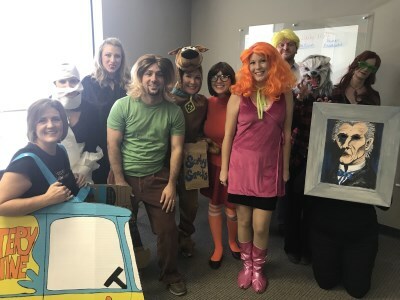 Our team had a great time last week at our office Chili Cook Off! It was so nice to gather together and enjoy a fun kick off into the fall season! 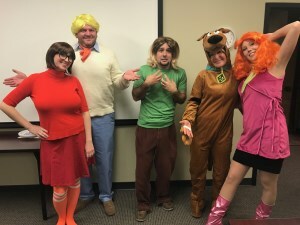 We also enjoyed the annual costume competition at this morning's weekly Keller Williams Realty East Team Meeting. We love getting into the spirit of things and are looking forward to office trick or treat this afternoon! Happy Halloween! May you have a fun and safe experience with family and friends this year. We are looking forward to the remainder of seasonal activities to come! Call 502-371-1173 to speak to a member of At Home In Louisville Real Estate Group or to learn more about homes for sale in Louisville, KY.
9104 Trentham Ln Louisville, KY 40242 is a four Bedroom two and a half bathroom home in Westwood. New owners will love the curb appeal and spacious interior. The front foyer features hardwood flooring. The Living Room is large. The Eat in Kitchen features a new refrigerator and connects to the Formal Dining Room. The good sized Family Room includes a cozy brick fireplace with built in book shelves. There is also a first floor half bath. Upstairs you'll find the Master Bedroom with attached Master Bath as well as three secondary bedrooms. The secondary bedrooms feature hardwood flooring and are close to a Full Bath. The basement has been partially finished with a Family Room and wet bar. The laundry & plenty of storage space are located in the unfinished area of the basement. 9104 Trentham Ln Louisville, KY 40242 has an inviting back yard with patio. The home also has a two car attached garage. Updates include bathroom cabinets, sink, faucets, plumbing and lighting in 2012. In 2017, the current owners replaced the back storm door and side garage entrance door. Call 502-371-1173 for more information about this home in Louisville. At Home In Louisville Real Estate Group is hosting 3 Open Houses this Sunday October 22nd from 2-4pm! We welcome you to join us and tour one of these beautiful homes for sale in Louisville, KY! 2908 Edmonia Ave, Louisville, KY 40220 is a beautiful three Bedroom one Full bathroom ranch in sought after Brookhaven. You will fall in love with this move in ready property with fresh paint throughout. The home has nice curb appeal and a welcoming front porch entry. The double wide driveway makes parking easy and convenient. 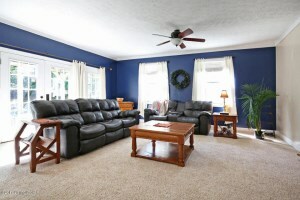 The Living Room features great natural light, cozy fireplace, hardwood flooring, & picture window. The hardwood flooring continues throughout the dining room and kitchen. 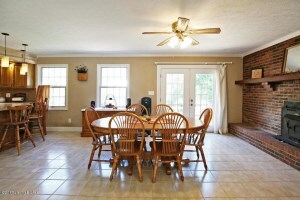 The Formal Dining Room offers a built in cabinet.The Eat in Kitchen has a pantry & adequate cabinet space. 2908 Edmonia Ave, Louisville, KY 40220 includes three bedrooms and a full bath on the main level. The basement opens to a large family room with recessed lighting. Another room in the basement could serve as another sleeping space. The laundry with built in storage is also located in the basement. 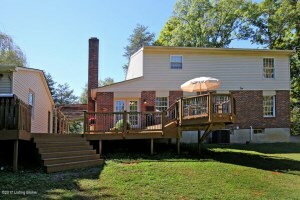 Outside you'll find a sunny deck, patio, & pleasant fenced in yard with storage shed- perfect for outdoor entertainment! Call 502-371-1173 today for more information or to schedule a showing at this home for sale in Louisville! 8133 Lake Ave B7, Louisville, KY 40222 is a open plan condo in the heart of Lyndon offering two Bedrooms and 2 Full Bathrooms! You'll love the location- walking distance to Westport Village & Robsion Park! The Living Room is open to the Formal Dining Room. Kitchen with plenty of cabinet space. 8133 Lake Ave B7, Louisville, KY 40222 has two nicely sized Bedrooms and one features an attached Full Bath. A second full bath & laundry complete the lay out. The green space surrounding the building is lovely. New owners will appreciate this second story unit. The building is secured and the unit has a laundry. Lovely views of the green space surround the building. New owners will appreciate this 2nd floor unit in a secured building. The 1st parking spot in front of building goes with unit. Pets are allowed with condo restrictions. Call 502-371-1173 if you would like more information about this condo for sale in Louisville or to schedule a showing! Join At Home In Louisville Real Estate Group this Sunday at our new listings on 1911 Heaton Rd & 2908 Edmonia Ave! You will love the tastefully designed three Bedroom one Full Bath Ranch at Heaton Rd! The property offers a 2 car detached garage, front porch, back patio, & fenced in yard! The property on Edmonia Ave offers 3 Bedrooms and 1 Full Bath in desirable Brookhaven! The home has been freshly painted with neutral decor and showcases deck, patio, & fenced in yard! Call 502-371-1173 for more information or visit with us at this Open House in Louisville! 262 Loretta Dr, Shepherdsville, KY 40165 is a gorgeous four bedroom three and a half bath home positioned on 1 1/2 lovely acres in Shepherdsville! You'll love the amazing location- just a half mile from Bernheim Forest! The Family Room is welcoming with crown molding and access to the side patio. The Eat In Kitchen showcases plentiful cabinetry and a spacious dining area with brick fireplace & access to the back deck. The first floor offers a half bath. The Master Bedroom includes a walk in closet and Master Bathroom with walk in shower and tiled bathtub. There are also two additional bedrooms and a full bath on the second level. The walk out basement contains a Family Room, Bedroom, Full Bath, & Laundry Room. The grassy back yard, deck, & patio are perfect for outdoor dining and entertaining. New owners will appreciate the three car detached garage. 262 Loretta Dr, Shepherdsville, KY 40165 offers numerous updates such as fresh paint, 2nd level carpeting, flooring in basement bathroom, & new roof on both home & garage completed in 2017! In 2016 the jetted tub was added as well as a sprinkler system with dual controls.Call 502-371-1173 for more information about this lovely home for sale in Shepherdsville, KY!